Forget warding off vampires, use garlic to ward off cancer, colds, infections and more. Greek physician Hippocrates, often called the father of Western medicine, said, “Let food be thy medicine, and medicine be thy food.” He actually used to prescribe garlic to treat a variety of different medical conditions. A sautéing favourite, garlic is not only useful in the kitchen, it’s proven to be a powerhouse health booster, even going so far as changing your genes. Your activities and diet can change your genetics. Food, exercise, lifestyle, environment and even eating garlic can turn genes on or off. These changes can influence your risk for cancer, and metabolic disorders like diabetes. Eating a healthy diet that includes garlic can reverse harmful changes to your genetics by changing your epigenetics. Side Note: What is Epigenetics? Simply put, epigenetics is the study of biological mechanisms that will switch genes on and off. Essentially, epigenetics affects how genes are read by cells, and subsequently how they produce proteins. Your genes can be turned on (active) and off (dormant), simply by the way you live your life. your diet, where you live, the people in your life and when you sleep can all eventually cause a chemical modification around the genes that will, at some point, turn those genes on or off. Epigenetics is the reason you look the way you do. Some of us have brown hair, or lighter skin, one person might love the taste of kiwis while the other can’t stand it. The genes in our bodies that are either active or dormant make each of us unique. With more than 20 000 genes, what could the results be of the different combinations of dormant and active genes? The possibilities are enormous. If we could ever figure out how to map the cause and effect of each combination, theoretically, we could have the power to slow aging, stop obesity and even cure cancer. So How Does Garlic Influence Epigenetics Enough to Prevent Cancer? Garlic and other alliums contain sulphuric compounds which give cloves their distinct scent and health benefits. Foods that are rich in sulphuric compounds increase histone acetylation by inhibiting histone deacetylases, metabolites which remove acetylation from DNA (Nian et al. 2009). In normal cells, when tumour suppressor genes detect cancer-like behaviour, such as uncontrollable cell growth, these genes sense that the cell is behaving badly, so they trigger cell death or stop cell growth. Cancer cells grow uncontrollably because the tumour suppressor genes are “turned off” due to low histone acetylation. Garlic increases histone acetylation, which in turn activates the tumour suppressor genes. These genes halt the growth and can trigger the death of cancer cells. Aside from cancer, garlic is natural health booster and a remedy for a variety of different ailments. The supplements garlic contains are known to boost the function of the immune system. One 12 week study found that a daily garlic supplement reduced the number of colds by 63% compared with placebo. Garlic is an antioxidant with antimicrobial, antiviral and antibiotic properties. It also serves as a decongestant. It contains vitamin C, enzymes and minerals such as sulphur (see above) and selenium. 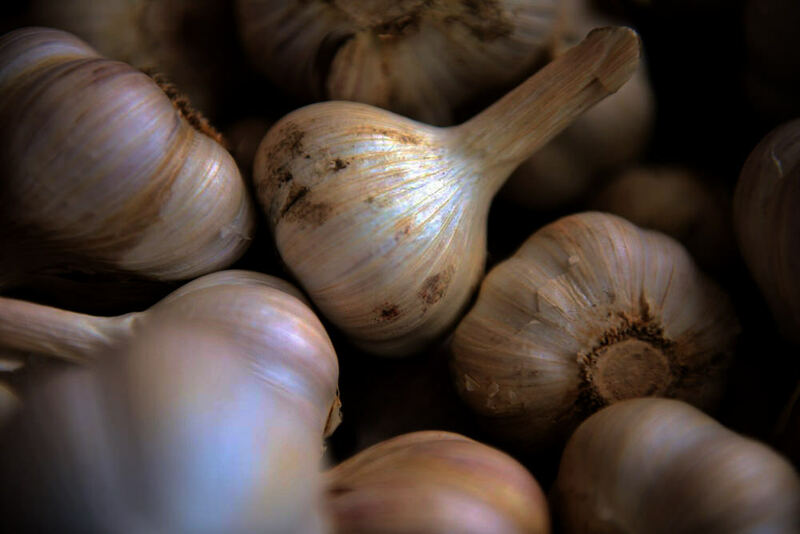 Allicin is a powerful antibacterial in garlic that is only present shortly after garlic is crushed and before it’s heated, so eating fresh garlic will definitely help you shake a stubborn cold. Garlic helps to cleanse and detoxify your system. Healthy skin starts with the inside of your body, after all, acne prevention begins with purifying your blood. The antioxidants in garlic can help with that. Take 2 cloves of fresh garlic with warm water every day and prepare to feel and look healthier. Cardiovascular diseases are the world’s biggest killers aside from cancer. Because of the antioxidant properties of allicin, eating garlic on a daily basis helps to lower cholesterol levels. It is also beneficial to regulating blood pressure and blood sugar levels. In one study, aged garlic extract at doses of 600-1,500 mg was just as effective as the drug Atenolol at reducing blood pressure over a 24 week period. Garlic contains antioxidants that prevent cell damage and aging. The antioxidants support the body’s protective mechanisms against oxidative damage. Combined with lowering cholesterol and blood pressure, the antioxidant properties have the power to reduce your chance of acquiring brain diseases like Alzheimer’s and Dementia. Forget caffeine to keep you awake! In ancient culture, garlic was used to reduce fatigue and increase the energy of labourers. As a restorative herb, garlic is also good for people who exercise and partake in athletic activities. Garlic increases energy levels and improves physical stamina. All this talk about “superfoods,” garlic is one you can actually trust. After all, doctors used it to combat sickness in ancient times! If you don’t have any garlic in your kitchen at the moment, you should already be on your way to the market. Garlic is a natural health booster, and in the long run, its nutritional and medicinal properties will help you live longer. Who wouldn’t want that? Who Knew Eggshells Were a Natural Health Booster? Psoriasis – What Causes Psoriasis? Sign up for our bi-weekly magazine!